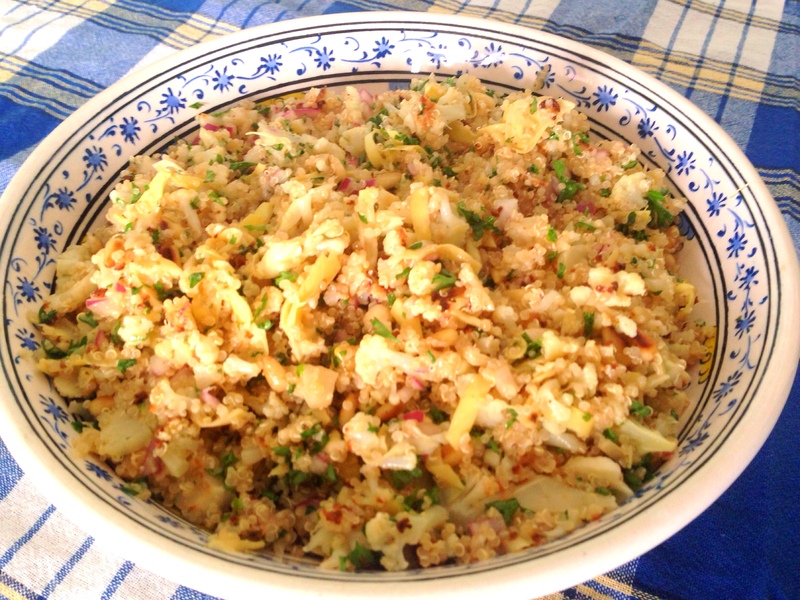 This quinoa salad is light and lemony and a great side dish. It’s perfect for spring or summer barbecues when you need some good vegetable side dishes. 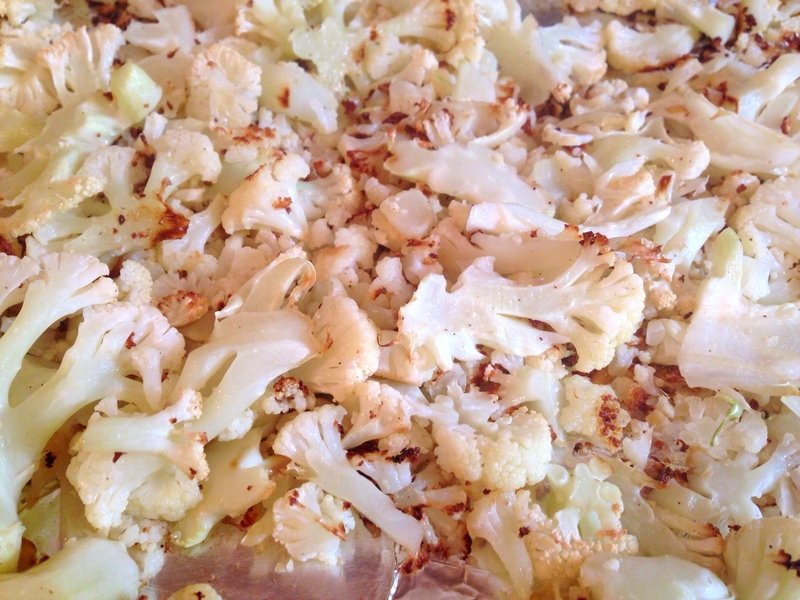 Roasting the cauliflower brings out the nutty flavor which complements the quinoa and the toasted pine nuts. I use white quinoa for this recipe because I like how it blends in color with the cauliflower and artichokes; the red onion and parsley offer the hints of color and flavor. The lemony dressing brings the flavors together with a nice acidic punch. To roast the cauliflower, slice it very thin and season then roast it with olive oil and some salt and pepper. While the cauliflower is roasting, cook the quinoa and slice the artichokes, onion and parsley and add them to a large bowl big enough to hold the rest of the ingredients. Add lemon juice, remaining oil and vinegar and seasoning to the artichokes. Add the cooked quinoa, cauliflower and toasted pine nuts. Mix all ingredients through. Chill for at least 2 hours so the flavors mesh. Thinly slice the cauliflower, slice it very thin and into small pieces and season it with salt, pepper and 3 tablespoons of olive oil and roast on a foil-lined pan for 25 minutes in a 400° oven. While the cauliflower is roasting, cook the quinoa in water in a covered pot for about 15 minutes, until cooked through. Add the artichokes, onion and parsley to a large bowl big enough to hold the rest of the ingredients. Add lemon juice and zest, remaining oil, vinegar, 1 teaspoon of salt, pepper and cumin to the bowl and mix through. When the quinoa is cooked add it to the bowl, then add the cauliflower, cutting the pieces as needed. Add the remaining teaspoon of salt and mix all ingredients through. Toast the pine nuts then mix them through. Chill at least 2 hours so the flavors mesh. 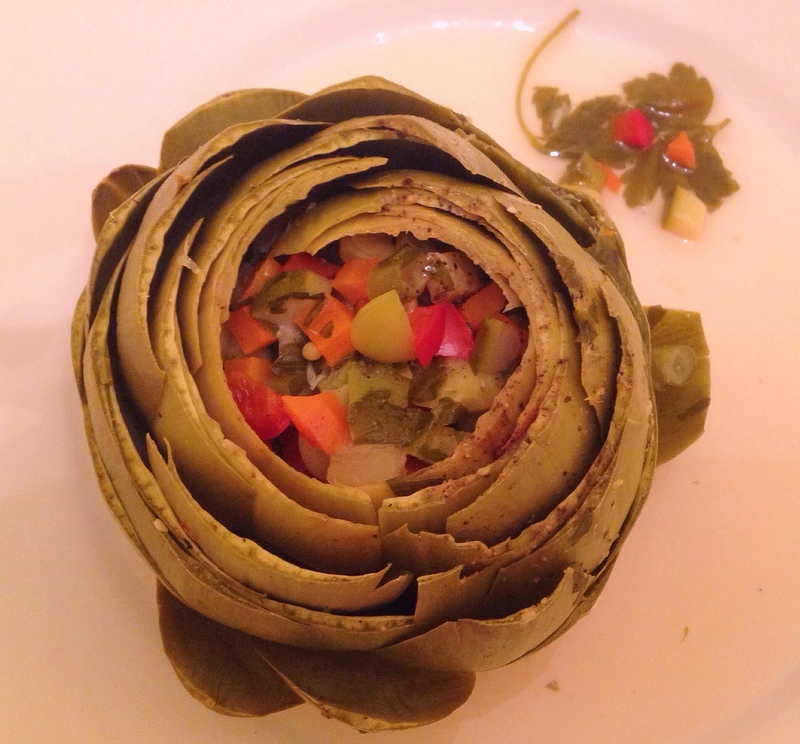 This entry was posted in Blog, Recipes and tagged Artichokes, gluten free, Lemon Dressing, Quinoa, Roasted Cauliflower on April 27, 2014 by Leslie. When I think of a stuffed artichoke, the first image that comes to mind is one that is stuffed with breadcrumbs flavored with oregano, garlic, olive oil, lemon juice and parmesan cheese, like those served in restaurants in Little Italy in New York, and at New York’s annual Feast of San Gennaro. My mother made her own version without the cheese, and it was a real treat when she made them. While artichoke hearts (often added to various recipes) are more common for the home cook and much easier to eat, I prefer to eat this savory vegetable in its whole state – picking each leaf off and eating them one by one. While they are messy to eat, require an extra bowl for the mounds of waste, offer just a bit of “meat’ on each petal and require a cleaning of the “hairy” choke before getting to the heart, which is the real “prize” in this vegetable, they are well worth all the work. Stuffing adds great flavor and more “meat” to each petal making it worth it even more. Besides flavor (and, yes, I also find them fun to eat), artichokes are also very nutritious, providing high amounts of potassium, antioxidants, and fiber. As I look to have less gluten in my diet, I look for alternative, healthier ways to eat them rather than the breadcrumb stuffing that I have come to know and love. Sometimes I steam them in lemon juice, water and garlic and dip the leaves in a vinaigrette. But there is something about a stuffed artichoke that seems quite decadent and, well, exciting to eat. This recipe for vegetable stuffed artichokes, uses colorful diced vegetables to offer the right balance of taste and decadence and cooked in a lemony broth. The key to making the vegetable stuffing, is to dice the vegetables into small pieces about 1/8”. I use carrots, red bell pepper, string beans, zucchini, lima beans (frozen or canned is fine), but you can use any other vegetables that you like. This stuffing recipe will yield more than you need. 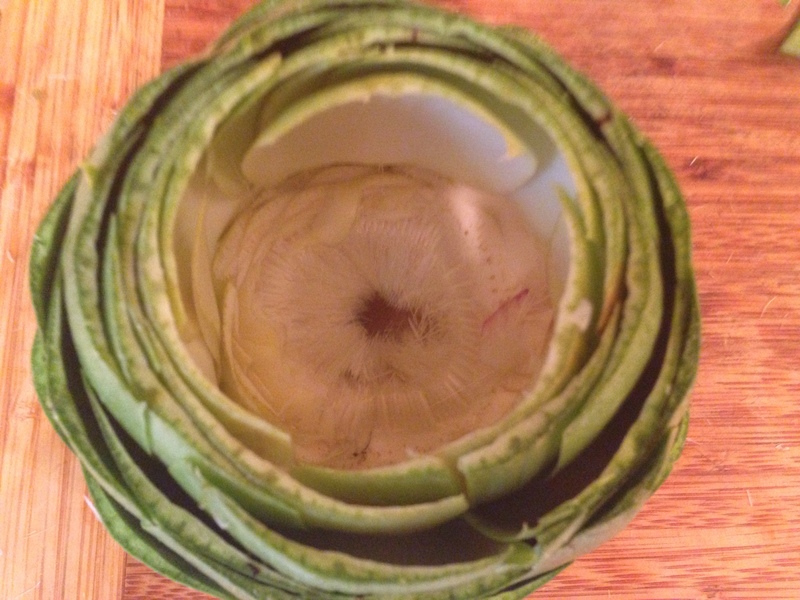 To prep the artichokes for stuffing, slice the top off using a serrated knife and cut off the bottom stem so that you have a flat bottom and the artichoke stands upright. Then cut each outer leaf with a scissor to remove the hard pointy tips. Then remove the center leaves and all the white pithy parts. If you can, scrape the choke out at this point, it’ll make eating a neater experience. If not, no worries, as it removes easy with a fork or spoon when eating them. Artichokes turn brown rather quickly once they have been cut into, so drizzle the cores with lemon juice as you’re finishing the prep for this dish. I cook these vegetable stuffed artichokes on the stovetop. Once the artichokes are stuffed, place them in a pot on the stove and add the lemon juice, garlic, bay leaf and salt to the pot, then fill the pot with water about 1-1½ inches high – but no more than halfway up the artichokes Cover the pot and simmer the artichokes for about an hour, until they are tender. To test the doneness, pick a leaf off and eat it. If it is hard, then keep cooking. You may have to add a bit more water to the pot to add a bit more water to the pot if the liquid evaporates before the artichokes are done. 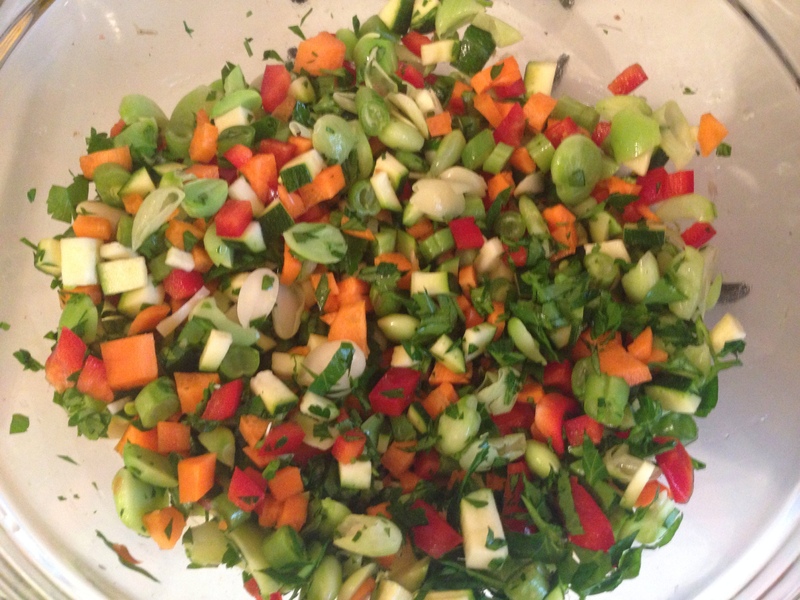 Make stuffing by cutting the zucchini, string beans, pepper, carrot into 1/8” pieces and add to a bowl. Cut lima beans in half and add to bowl along with parsley and 1 teaspoon of salt. Mix the stiffing mixture through. Prepare artichokes by cutting the top off and the bottom stem, using a serrated knife, so that you have a flat bottom and the artichoke stands upright. Then cut each outer leaf with a scissor to remove the hard pointy tips. Then remove the center leaves and all the white pithy parts. Drizzle the core of the artichokes with lemon juice. Stuff the vegetables into the core of the artichokes and stand them up in a pot (I use a Dutch oven). Add the lemon juice, garlic cloves, bay leaf, 1 teaspoon of salt to the post and add enough water to cover about 1”-1 ½” of the artichokes but no more than halfway up the artichokes. Cover the pot and simmer the artichokes for about an hour, until they are tender. To test the doneness, pick a leaf off and eat it. If it is hard, then keep cooking. You may have to add a bit more water to the pot if the liquid evaporates before the artichokes are done. 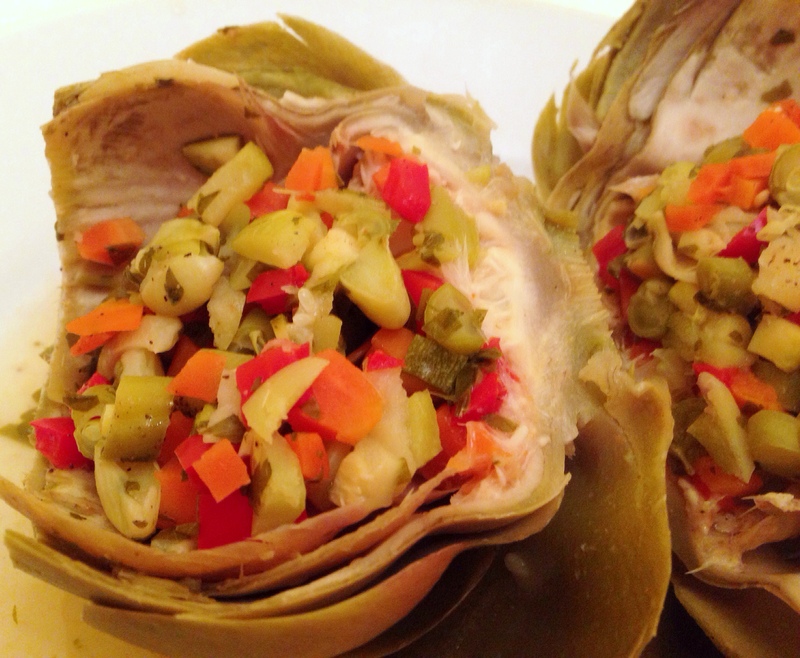 This entry was posted in Blog, Recipes and tagged Artichokes, Stuffed Artichokes, vegetable stuffed artichokes on March 1, 2014 by Leslie.